The biggest and most vibrant of all Scandinavia's many cities, Copenhagen has been the proud Danish capital for almost 400 years. 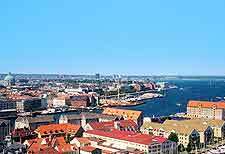 Much of Copenhagen is fairly low-rise, with the appealing skyline being punctuated by a number of rising church steeples. Copenhagen has grown steadily over the years, expanding from its historic centre, where many of the city's most noteworthy historic buildings are clustered, together with a network of parks, public squares and green spaces. 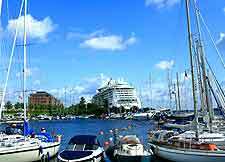 The coastal scenery has long been a major draw card in the city and the award-winning Harbour of Copenhagen remains one of the world's most important cruise destinations, regularly rated as Europe's premier port. Those in need of some tourism advice, or simply wishing to purchase the moneysaving Copenhagen Card, should visit the Wonderful Copenhagen tourist information centre off the Bernstroffsgade. The tourist office produces a number of fold-up maps with both street indexes and useful keys to the main sights, and these come completely free of charge and are also available at the information desk within the airport (Kobenhavns Lufthavn). You will find that the days fly past quickly in Copenhagen, since there is so much to do. Spend a day having a blast at the extremely popular Tivoli Amusement Park, which is home to the historic wooden roller coaster Rutsjebanen and situated in the very centre of Copenhagen. 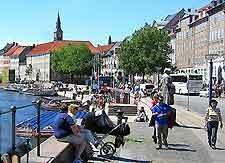 Alternatively, board a canal boat and enjoy a tour of the scenic waterfront, spend an afternoon enjoying a chilled Danish beer outside one of the main bars lining the Nyhavn Canal, or go shopping along the Stroget, which is known for being the longest pedestrian mall anywhere in the entire world. 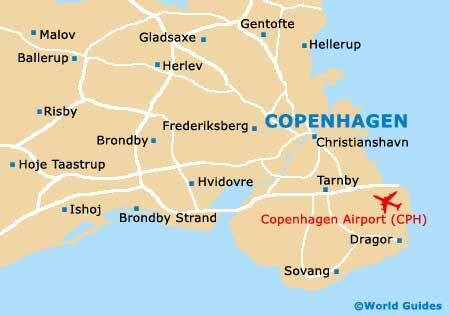 More information about Copenhagen Tourist Attractions. Try to make time to simply stroll around central Copenhagen and soak up the atmosphere, looking out for local landmarks, such as the Christiansborg Slot (Christiansborg Castle) and the Borsen (Stock Exchange), both of which reside on the Christiansborg Slotsplads. Close by and dominating the Town Hall Square itself (Radhuspladsen), the Kobenhavns Radhus (Copenhagen City Hall) is easily spotted by its distinctive clock tower. However, few Danish landmarks come more famous than the Den Lille Havfrue (Little Mermaid), a rather small bronze statue next to the harbourfront, celebrating the famous mermaid character created by Hans Christian Andersen and later immortalised by Disney. More information about Copenhagen Landmarks. A number of truly world-class museums reside within the city of Copenhagen, such as the Carlsberg Museet (Carlsberg Museum), where you can enjoy guided tours of a working brewery before sampling the actual produce at the end. The Nationalmuseet (National Museum) is another gem and was established as far back as 1807 and contains many priceless Danish treasures and an interesting exhibition remembering the Viking Age. If art galleries are more to your taste, then Copenhagen will not disappoint, with highlights including the Malerisamlingen Ordrupgard (Museum of Modern Art), the Statens Museum for Kunst (State Museum of Art), and also the Royal Danish Academy of Art, located within the magnificent Charlottenborg Palace and filled with Danish masterpieces. 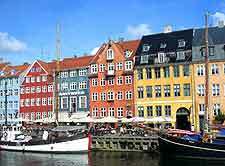 More information about Copenhagen Museums and Copenhagen Art Galleries. In the unlikely event that Copenhagen only serves to whet your appetite and you crave more of Denmark, then close by are many notable tourist attractions. Next to the Oresund Strait (the 'Sound'), Charlottenlund is a wealthy and engaging suburb, with a sandy beach and remains of a historic castle (Charlottenlund Fort). Day trippers from Copenhagen will also enjoy spending time around Amager Island and the waterfront of Dragor, relaxing on Bellevue Beach at nearby Klampenborg, visiting the vibrant town of Frederiksberg, or zooming around on the fast roller coasters at the Bakken Amusement Park, within the Dyrehaven Deertpark area. More information about Copenhagen Attractions Nearby.